For most of us, Pinterest brings to mind crafts we’ll never make, places we’ll never visit, and wedding dresses we’ll never buy. But when teachers log on to the social scrapbooking site, they search for things like pasta-noodle skeletons, rock-candy recipes, and numbered cootie catchers—not as part of a crazy home-decorating scheme, but to actually use in their classrooms. At a time when social media has broken down geographic barriers across countless professions, teachers have turned to places like Pinterest in droves, and not because they’re particularly prone to distraction. 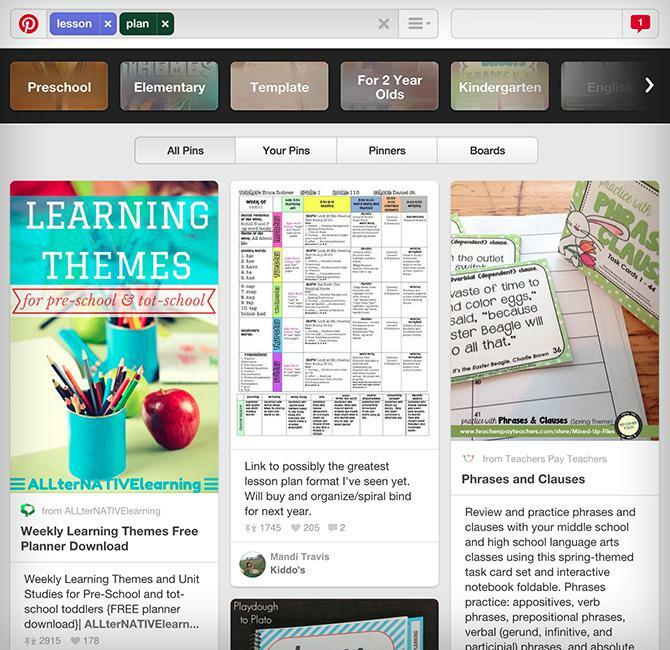 For thousands of teachers, Pinterest has become an important venue for professional development—a place to find creative lesson plans, classroom decorations, and teaching tips. Suzy Brooks, a fourth-grade teacher in Falmouth, Massachusetts, checks Pinterest multiple times a day, scouring the site for discoveries that often make their way into her classroom, sometimes within hours. She’s unearthed a student-teacher letter-exchange strategy that helped her shore up her writing instruction, for instance, and a way of teaching math concepts through dance moves. “Everyone from the 60-year-old secretary to the 29-year-old custodian” uses Pinterest, says John Hughes, the principal at Cottonwood Elementary in Orangeville, Utah, who also teaches sixth grade. Pinterest isn’t likely to supplant traditional, in-person forms of professional development anytime soon, nor would most teachers necessarily want it to. But its growing popularity as a source of lesson plans and other classroom ideas reflects a longtime void in the way America has historically gone about training and re-educating its teachers: For many, that training can simply be too rigid and inefficient. When teachers attend what are known as “PD days,” that often means gathering for a day or two at a conference or workshop and listening to speakers present on various topics. Professional development, of course, varies by district and school, some of which also rely on intensive, classroom-based mentoring programs. But the workshop is the most common method teachers encounter. As Linda Darling-Hammond, an education professor at Stanford University, points out in a 2009 survey on teacher training opportunities, educators have long questioned the usefulness of the so-called “one-shot workshop.” Jeff Carpenter, an education professor at Elon University, says that teachers have complained to him for years about having to sit through workshops that aren’t relevant to the students or subjects they teach. It’s not that all traditional professional development is bad, Carpenter says, just that the workshop structure has limitations. It often assumes that teachers want to learn about the same topics and approach them with the same amount of prior knowledge. Ideally, professional development should be specific, ongoing, and intensive, as Darling-Hammond outlines in her report. Pinterest is by no means intensive. It’s not necessarily ongoing. And it’s certainly not a one-stop solution to shortcomings in teacher training nationally. But many teachers like the fact that they can search for exactly what they want to learn—middle school social science lessons, for example—and connect with others who teach the same grades or subjects. Pinterest usage, in general, has risen steadily over the past few years, but teachers have become an especially important group for the site. Education pins per day climbed from 500,000 to about 1.3 million last year. And when the University of Southern California’s Rossier School of Education polled educators online in August, 38 percent reported using Pinterest to find resources (second only to Twitter). Last summer, Pinterest gave teachers their own hub on the site where they can find resources organized by grade level and subject. The page now has 32 boards and more than 100,000 followers. Popular lesson plans on Pinterest can be posted and reposted thousands of times, and those involving food do particularly well. A DNA strand that’s made from licorice, toothpicks, and marshmallows notched more than 2,000 reposts. So did one that showed how Oreos can be used to teach the phases of the moon. 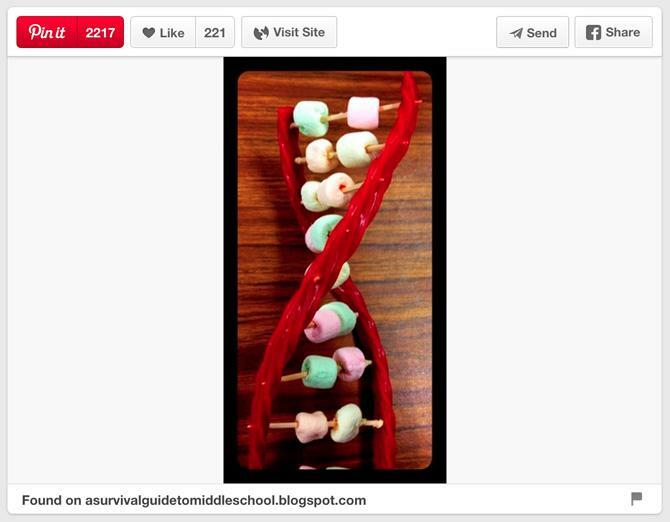 An edible middle school science lesson on DNA. 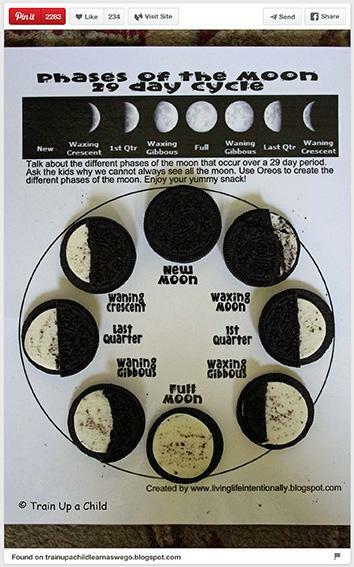 A lesson that uses Oreo cookies to teach the phases of the moon. 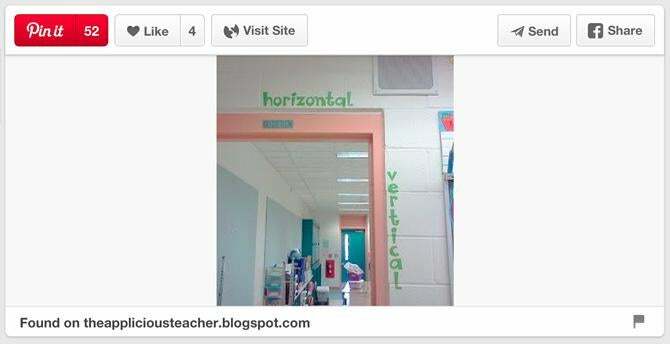 A typical Pinterest board will yield creative tips on how to make a classroom more organized, says Brooks. A few months ago, for example, she repinned a picture of a door with the words vertical and horizontal pasted parallel and perpendicular to its frame. The pin was, at first glance, a classroom labeling suggestion, but Brooks used it as a broader reminder to present concepts visually as well as verbally in her classroom. Though much of what circulates on Pinterest is free, some teachers are profiting by selling their own lesson plans to one another for small fees and advertising their products on Pinterest. Suzy Brooks pinned this photo from another classroom several months ago. Pinterest will likely never replace something a lot of traditional professional development does very well: giving teachers the time and the space to meet one another in person. In Hughes’ opinion, the most meaningful professional development “requires discussion about best practices,” something pinning alone does not allow for. Increasingly, teachers are turning to Twitter, message boards, and other online resources for this purpose, but most still value learning alongside their colleagues, he says. Indeed, the best professional development in the future may build on the strengths of both online and more traditional forms, using the site to help redefine rather than replace teacher training. Many conferences incorporate social media and technology into their sessions. Teachers use Twitter hashtags to speak with one another at big events and Pinterest boards to collaborate on notes and resources after workshops have ended. This isn’t happening at every education event across the country, but social media is slowly helping teachers get more out of the traditional lectures and workshops they’re attending, says Lisa Johnson, an education technology expert in Texas. Kevin Scritchfield and Janet Adams, who created the course and are both classroom teachers, say they teach teachers much more than how to navigate the site, trying to help educators learn how to use social media to enhance student learning in the classroom on a daily basis. 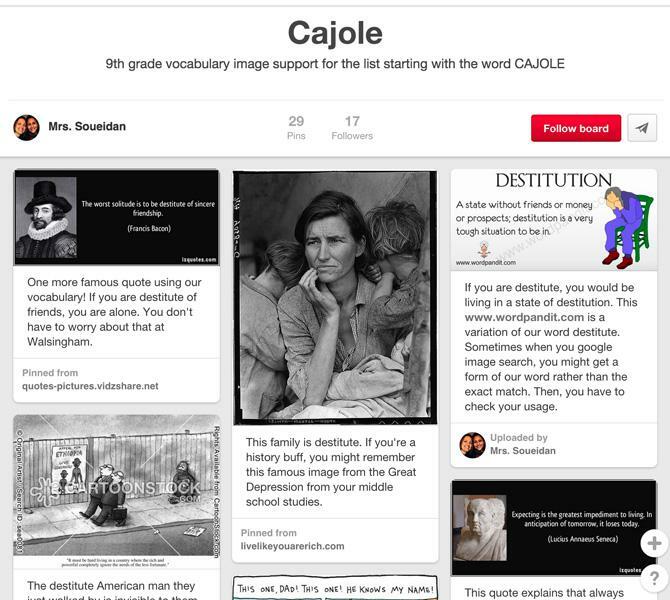 A teacher combines ninth-grade vocabulary words with images and definitions on Pinterest. Brooks even gets professional credit for her Pinterest activity, since Massachusetts teachers are evaluated partly on how well they “collaborate.” She and her colleagues take screenshots or print out copies of their shared Pinterest boards to prove they’ve worked together. It’s not quite the same as sitting side-by-side at a multiday workshop. But when it helps you discover a great lesson—like a creative writing activity in which students “write” poems by taking newspaper articles and blacking out words—it can be a whole lot more meaningful. Madeleine Cummings is a fellow for the Teacher Project, an education reporting initiative at Columbia’s Graduate School of Journalism dedicated to covering the issues facing America’s teachers.